Today, I’m talking about how the rider’s mind and the rider’s body are both equally required for improvement. I’ll be talking about balancing your aids and your mindset. 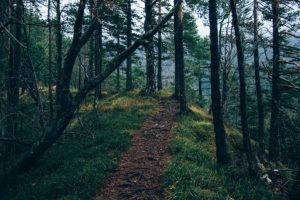 A listener asks about allowing something to flow and making something happen. This is all about balancing. You need to have a mindset where you can back up the requests you make. I explore this topic with listener emails, my own experience, and what I’ve observed watching horses and people. [00:49] A listener email: James asks about the catch between allowing something to flow and making something happen. [01:21] The rider needs to be able to make a request followed by a willingness and an ability to back it up. [01:46] Think of a teeter totter and the balancing point in the middle of it. [02:09] The mental part is the willingness to make the request. The ability to back it up is what we are physically required to do. [02:18] Four different aids that we talk about a lot. These include the rider’s hands, legs, seat, and voice. [02:39] The hands are the first thing people think about using to control the horse. The second is the legs. [02:51] The seat and the voice fall into the category of a please. The hands and legs have a way to backup the request. [04:28] When you can add pressure you can also add release. [04:54] Most riders are willing to make a request, but it gets a little fuzzy when it comes time to back it up. [05:15] Stacy shares listener emails. Also, have your horse checked out by a vet if there are issues. [06:39] Horses sometimes draw a line of what they are willing to do. [08:30] Stacy shares varying degrees of pressure with her legs as backup queues after requests. [09:18] People are afraid to hold horses accountable when there’s a physical aspect to the training. [09:56] When horses communicate with each other they make a request and have a willingness to back those requests up. [11:02] Pressure can feel firm without feeling like punishment. [12:42] Horses have different tolerance levels and that can create tension when riders make requests and the horses don’t willingly follow it. [13:46] Part of balancing your aids is you mentally accepting that the aids are okay and that you’re willing to use them. [14:10] The horse will figure it out if it bothers you to use your hands or legs. [14:52] The tension in your mind can affect how you use your hands or legs. Hands can be used fast or slow or light or firm. [16:08] People struggle with how firm or fast or slow they should use their hands. [16:57] A lot of horses won’t pay attention to a really light request. [17:24] Reflect back on the idea of what you think is changing how you ride. [17:49] The middle of the teeter-totter feels like allowing something to flow. If necessary, I step in and make things happen. [18:15] I started this podcast because I really have a desire to help people understand what’s going on with their horses. [18:21] I never promised that it would be easy to execute. [18:47] The mindset you have towards using your aids or hands and legs is the key to going forward. 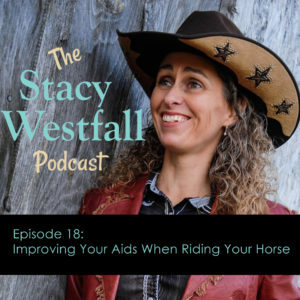 ← Episode 17: Are You Helping or Interfering With Your Horse When Riding? I could see it being both physical and mental for Hildy. If she doesn’t do it more then it will be harder because she won’t be fit for it. But getting fit for something new is hard…and is often protested by those being asked to do more. This can also be added to if the horse happens to fall on the naturally more lazy side (vs being on the hot side). The place I begin is looking at it as a fitness routine. Like kids who are told they need to move the horses may protest. If they are sound and healthy then remove the guilt and think about the health benefits (kids and horses don’t consider this). When she can lope substantially more you can then check in and review her attitude. Jesse sent one lesson student home with the assignment of getting to where he and his horse could lope five minutes straight. It was hard work but when accomplished the rider was amazed at all the things that had improved! That makes a lot of sense. i guess we could relate it to running. When you first start, IT IS HARD!! and honestly I was not happy about it. I like when I was younger and did not have to do much to stay in shape! It is also frustrating because it takes a lot of determination. I can totally relate to what you are saying above!!! I am still working on running. So many things to get done in one day! Not enough time to fit everything in especially since the weather is getting nice, I want to ride when I get home from work. #equinecrossfit! Walk-jog with your horse! Get fit and work on those liberty cues (with the lead still on) all during your warm up/cool down from your ride! 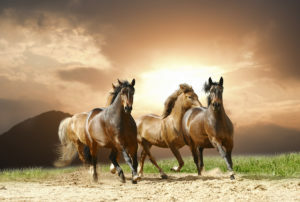 It was born from my resistance to take time away from horses to work out…so I started working out WITH my horses! This is my favorite podcast. I think I say that every time I listen to one. My question is, what if you back up your requests and the horse still does not give to the physical pressure (kind of like Presto and the kicking), or instead, reacts negatively with unwanted behavior (like throwing his head or swatting his tail) that is not due to a physical issue? And how would you reverse the mistake of your horse thinking you won’t back up your requests? I’m thinking of multiple horses with these questions. There is one horse I work with that is sometimes very willing to respond and other times he is not. This inconsistency causes me to second guess my behavior. I try to be as consistent as possible but I get different responses back. Ok. There are two ways to look at phyical pressure. Let’s use Presto to continue the example. If one of the little mares kicks him…he might not move. But when Popcorn gives him ‘the look’ Presto moves. Why? Several reasons actually. First reason: Popcorn is willing to escalate to whatever is needed. Second: Once Popcorn starts…he continues to persist until he gets the response he wants. The great thing about Popcorn is that he rarely goes from asking (we will call that a 1 out of 10) to really aiming to hurt (10 out of 10). What Popcorn WILL do is consistently go 1-2-3…slowly warning. When Presto was younger he would go one number at a time until he got what he wanted. Now that Presto is older he will sometimes jump from 3 to 7. Basically, he expects more now than earlier in Presto’s life. I use the same willingness to go up through the numbers. Repetition can be motivating. I use that most frequently with repeated taps. The intensity of the taps is another factor. I try to stay at a level where he just shows recognition of the pressure (maybe head bob, ears flicking, etc) but not enough pressure to actually ‘make’ him do it. If he starts to fall asleep…I increase the intensity. I’ll go into this in the next season of the podcast more when I talk about the horse’s mind! Feel free to remind me! That’s extremely helpful! Looking forward to learning more about the horse’s mind! The timing of your podcasts have been impeccable for me at this stage in my life. I have always wanted to start and train young horses to the point where they are ready to move into their new persons chosen discipline. I currently have a gelding just started under saddle and a filly with basic groundwork under her belt. Both have very different energies, the gelding is very laid back and chill, not a lot phases him. The filly, on the other hand, is initially a fireball and will run with the wind, but once she knows it’ll be ok, she’ll settle down and be chill. Anyway, this podcast in particular related to the gelding last week when I took him out to let our cows chew the grass on the side of our road (it’s a no through road but I notify the neighbour’s so they didn’t end up with a cow in their grill). It was his first time out in the big wide world with a saddle on, so I walked him down the road to where the cows would need to stop, and took a halter with me to let him have a chew on the sweet grass also (I live in Australia and it has been pretty dry here of late). Skip it’s to time to go home, I was expecting him to be like woot woot, yep let’s head home and happily follow the cows back up the road, but apparently that sweet grass was much better than heading home, so we spent the first 100metres or so weaving up and down the road til he figured it was better to just poke along behind the cows. Now we got the cows, in pretty nice and steady (a good dog is priceless when on a young horse), but then as I was riding past the gate, he thought he’d try his luck at walking through the bridle and heading over to some other horses in the paddock. Which is where I needed to back up my request of walking past the open gate. A little extra pressure on my left rain and right leg and he stepped left and off of the pressure. Winning! The beauty of your podcasts is that it helps me to realize that this is normal behaviour for him to want to do all of those things,m. All I need to do is teach him that when he is with me, it’s better to stay with me. I hope that all made sense. Looking forward to the next podcast. I’m so glad the podcasts are helpful to you! Horses, cows, grass, dog…it makes me want to join you!